The Why: In most of the country it’s cold – very cold – and let’s face it, drinking hot chocolate makes most of us feel better. In fact, chocolate contains a number of chemicals that affect brain activity. One of these is tryptophan, the building block of serotonin, which is a relaxation-inducing neurotransmitter that, in large doses (chocolate has small amounts), causes elated or ecstatic feelings. Chocolate also contains anandamide, a substance that stimulates the same brain cell receptors as THC, the psychoactive substance in marijuana that induces feelings of euphoria, and phenylethylamine, a brain chemical known to promote feelings of attraction, excitement and giddiness. Health Perks: Among the key health benefits of chocolate are antioxidants, chemicals that slow down the aging process and help to prevent heart disease and certain kinds of cancer by blocking the cellular and arterial damage caused by oxidation. Of particular interest is the subclass of antioxidants called flavonoids, which have been proved to keep blood healthy and prevent cell damage and inflammation. A diet supplemented with these antioxidants can slow oxidation of LDL (“bad” cholesterol) and increase the level of HDL (“good” cholesterol). In addition, studies show that people who enjoy moderate amounts of dark chocolate ­ about half a bar per week ­ have significantly lower blood levels of C-reactive protein, a key marker of inflammation. Flavonoids are also found in green tea, grapes and red wine, but, according to the USDA’s ORAC (Oxygen Radical Absorbance Capacity) database, dark chocolate has the highest antioxidant capacity compared with all fruits and vegetables. When selecting chocolate, however, you should keep in mind that, according to the Journal of Agricultural and #Food Chemistry, “Evidence from the literature indicates that natural cocoas are high in flavanols, but when the cocoa is processed with alkali, also known as Dutch processing or Dutching, the flavanols are substantially reduced.” This means that when you make milk chocolate using alkali you reduce the benefits. Another heart-healthy chocolate benefit is that it contains stearic acid, a saturated vegetable fat that, when ingested, acts like the monounsaturated fats found in olives and canola oil. Unlike the saturated fat in butter, which may raise cholesterol, monounsaturated fat has a neutral effect, or may even help lower blood cholesterol. So, chocolate raises good cholesterol, lowers bad cholesterol, and its polyphenols can also prevent the DNA damage that may lead to tumor formation. The downside is that the calories in chocolate can add up, and you can get many of the same benefits from drinking green tea. Another problem is that there aren’t any really good ways to tell from the package (apart from the information provided by the manufacturer) whether or not the chocolate you are buying has been tested for its flavonoid content. Look for dark chocolate with a high cocoa content ­ at least 60-70 percent ­ because that’s where the flavonoids occur. But cocoa is also quite bitter. It’s the added sugar and fat (including milk and cream) that give chocolate its sweet taste. And keep in mind that if the sources of the cocoa, chocolate liquor or chocolate are modified by the words “alkalized” or “Dutch” or “Dutch processed,” it is unlikely to have a significant level of flavonoids. (Milk chocolate uses this process, and benefits are limited). Other things that affect flavonoid content are bean selection, fermentation time and formulation techniques, none of which are indicated anywhere on the package. 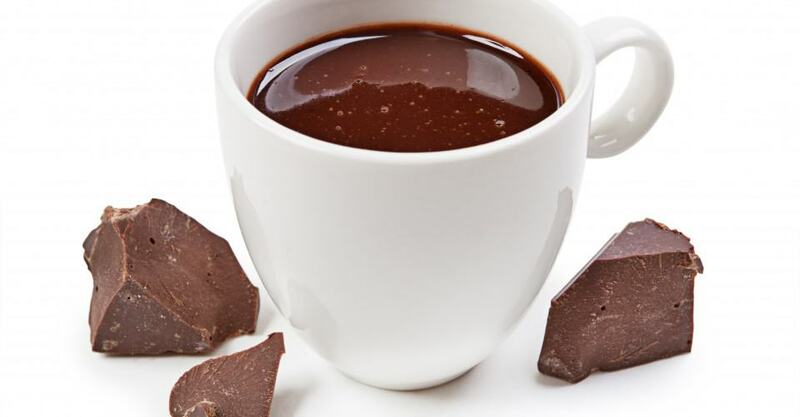 Use about 1 ounce of 60% cocoa chocolate shavings mixed with skim milk, Splenda, stevia or sugar and vanilla extract to make a cup of hot chocolate. I don’t recommend having it on a daily basis, but once in a while is not so bad. Also, keep in mind that in order to get the health benefits of dark chocolate without too many calories, you should have no more than one 1-ounce square. The Why: It’s pretty tasty, for starters, and there are many important health components in apple cider, especially bioactive, functional food components, including vitamins (mostly C) and phenolics. Health Perks: In several epidemiological studies, apple consumption has been associated with a decreased risk of chronic diseases such as cardiovascular disease, cancer, diabetes and asthma. Apples are loaded with flavonoids such as quercetin, which is important for keeping blood vessels healthy, reducing inflammation throughout the body, preventing DNA damage that can lead to cancer and slowing cancer cell growth and reproduction. One study, from the German Cancer Research Center in Heidelberg, stated that apples may reduce the risk for lung and colon cancer. In terms of cardiovascular health, properties in apples decrease lipid oxidation, which helps to delay the breakdown of LDL or “bad” cholesterol. When LDL oxidizes in the blood, plaque accumulates along the walls of the coronary artery and causes atherosclerosis. Scientific research also suggests that apples could help fight off Alzheimer’s disease. According to scientists at Cornell University, the antioxidant concentration in apples is among the highest of all fruits and similar to that of store-purchased blueberries (wild blueberries are the highest), which are often touted as having the highest antioxidant activity. The antioxidant content of apples was originally underestimated because bound phenolics (phenolics that survive stomach digestion) weren’t included, and the phenolics in apples are more bioavailable ­ meaning that they are more easily absorbed into the bloodstream ­ than those of many other fruits. Apple cider is made from the liquid portion of the apple. Therefore, some important functional components that stay within the skins and flesh may not be in the cider. So, it’s still better to eat an apple than to drink a cup of cider. Typically, commercially prepared cider is just juice, but supermarkets and specialty stores often have the real stuff. Apple cider is made from pressed apples; the idea is to keep the pulp, and some makers even keep the peel (the most powerful source of health benefits). To get the most from your apple cider, make sure to get real apple cider, which is cloudy because it’s not filtered like apple juice. Have apple cider a few times during the #winter, and make sure to eat a real apple every day – yes, to keep the doctor away.